In HARVESTER, Erik Castro’s bold, gorgeous photography documents the individuals who travel great distances to toil in California’s grape harvests. For each image, Erik photographed a Sonoma County harvest worker the moment after he or she completed a harvest pick. “Like street photography, I wanted the photos to feel like fleeting moments. It’s a purely visual story with each face its own personal narrative,” says Castro. Originally from Los Angeles, Erik Castro began his career as a documentary photographer in Seattle during the late 1990s focusing on issues concerning low-income residents and those struggling with drug and alcohol addictions. Castro has won multiple National Press Photographers Association Awards for his multimedia work and for his wildfire coverage in Lake County, California in 2016. He is a frequent contributor to The Press Democrat and the San Francisco Chronicle and his work has been exhibited in Seattle, Los Angeles and at the Sonoma Valley Museum of Art. He is the sole photographer for a book about a new generation of winemakers titled, “The New California Wine.” Castro continues to work on his immigrant labor project HARVESTER and he is also working on a year-long project about a homeless couple living in Santa Rosa, California where he resides. The public is invited to a free reception and talk by Erik Castro on Tuesday, February 20, 4-6 p.m. in the library. 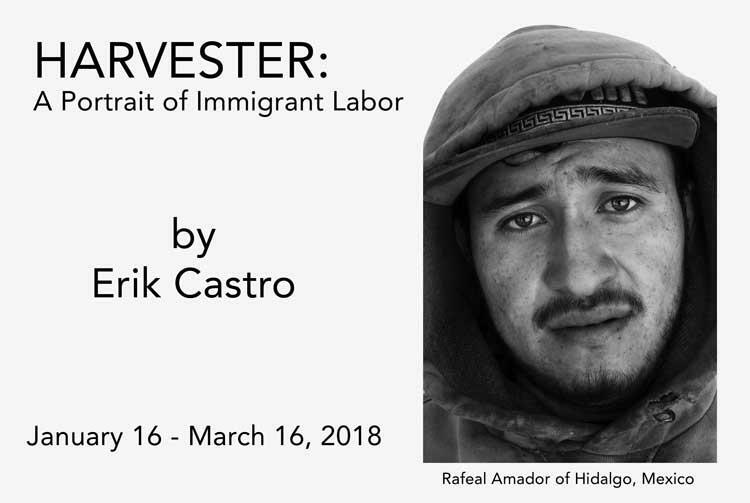 Castro will discuss his artistic passion and humanistic aspects behind HARVESTER. Parking on campus is $5-$8. Light refreshments will be served. RSVP to library@sonoma.edu or 707-664-2397 for a reception parking pass. Sponsored by the University Library and made possible by the Jean and Charles Schulz Endowment.